Where to eat in Heraklion? 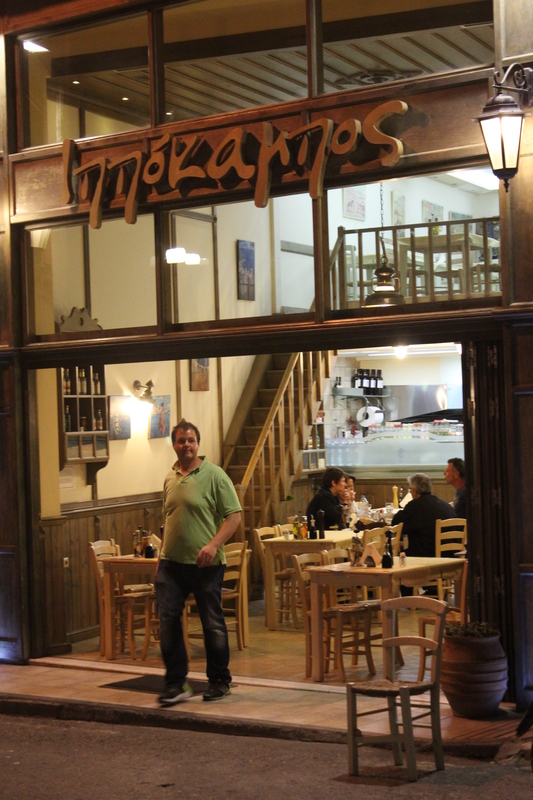 Before leaving for Crete I had read good reviews in Tripadvisor about a restaurant called Ippokampos. It had seemed like a humble, simple place with fresh, local ingredients –exactly what I like. Upon arrival in Heraklion our hotel recommended it too, saying it is very popular amongst the locals. They also told us that the translation means seahorse (I am very curious about seahorses). Without further contemplations, Ippokampos became our cantine during the two-night stay in Heraklion. The first night we ate at the terrace while enjoying the warm Mediterranean breeze. The choice is enormous so it was a difficult pick. 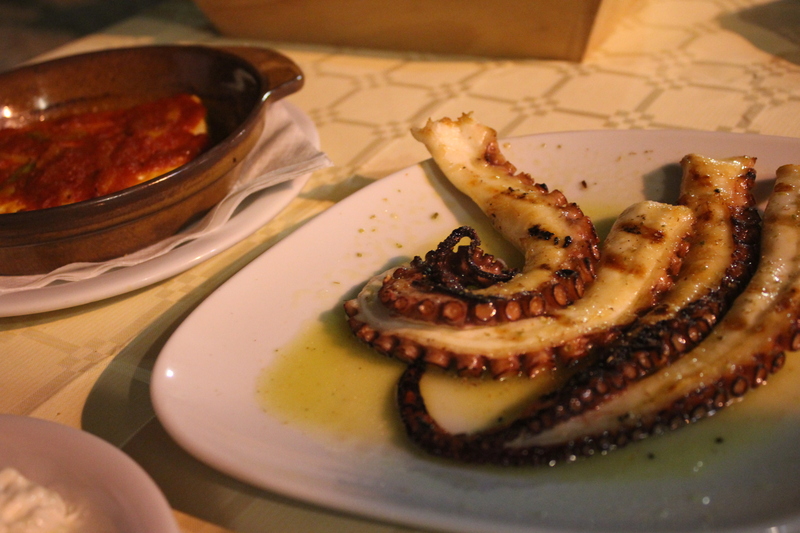 Finally, we ordered different mezze (appetizers) t o share: tzatziki, feta in the oven (with tomatoes and bell peppers), grilled vegetables, cuttlefish with its ink and grilled octopus. And some very tasty white house wine. Excellent. Very healthy tasting. Not salty, not fatty. I understood immediately why Cretans live a long life! The next day there was a bit of rain, so we ate inside (try to get a table downstairs, it is more fun than upstairs). 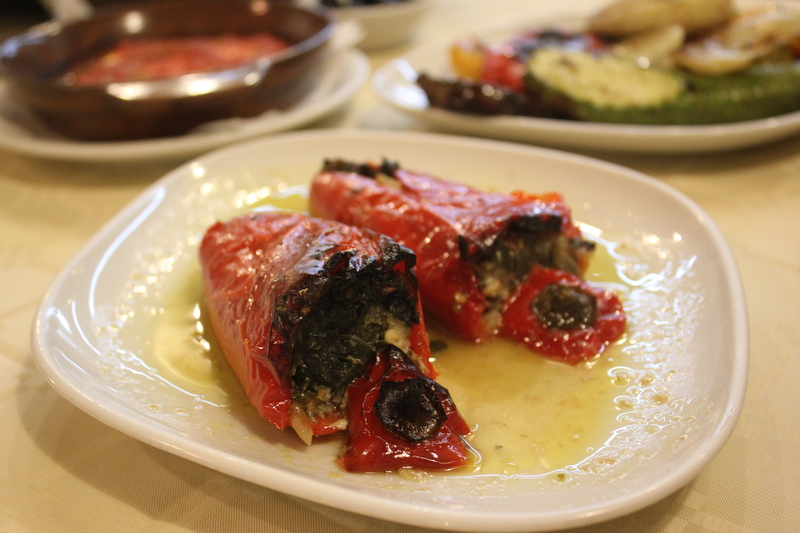 We went for grilled octopus again, mashed split peas (which is ser ved with raw onions that you mix into the puree), grilled mushrooms as well as stuffed peppers with anchovies. This time we chose the red house wine and it was very nice, too. Again, nothing to add, everything was excellent. As the nigh before, we were again offered a carafe of raki and a dessert (the orange cake was particularly delicious!). The young owner Michael knows his dishes by heart and was eager to answer all of our questions. As often in Crete, the rest of the questions were answered by inviting us to the kitchen to look at the dishes. Now that the holidays are over I can confirm that Ippokampos is probably the best place we ate at during our nine-day holiday. I would go back to Crete just for them. The owner Michael told me that he is working on a Facebook page and that it should be up “very soon”. I will certainly keep following them and their developments. 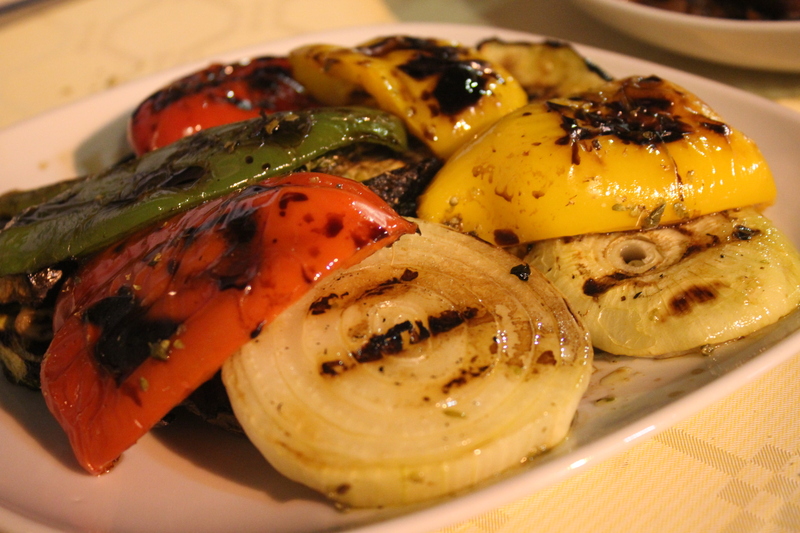 This entry was posted in Uncategorized and tagged Crete, food, Greece, restaurant on May 24, 2013 by Miia. Hello! Thanks for your message. To follow my blog, please go to the main page. On the right-hand side you see a photo of me. Scroll down and keep looking at the right-hand side. Soon you will see an empty box with a text “follow”. This is where you enter your email address. Hope to have you back soon! really like what you are stating and the way through which you are saying it. and found that it’s truly informative. I am gonna watch out for brussels. I will appreciate if you continue this in future. A lot of people will be benefited from your writing. Cheers!